The raw material, mainly scrap, production scrap losses and ingots are introduced in to the melting furnace. When the aluminium is heated in the furnace it is transforms into aluminium liquid. It is then transfered in to another oven to refine, prepare the alloy and adjust the temperature. When it is done, the liquid aluminium is poured in a moulds to be cast in to slabs. The moulds cast slabs 5 metres long as you can see in the picture. 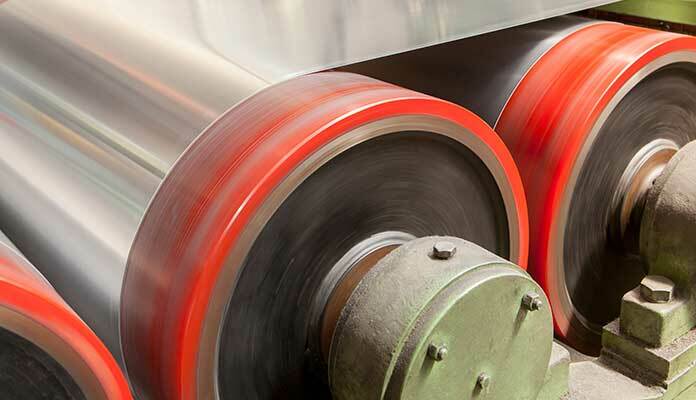 reduce the thickness of the slabs and convert the slab in to hot rolled coil after several passes. After the hot rolled coils are cooled, they are introduced in to the cold rolled mill. We use special cylinders with the latest technology for fine finish and thickness control. 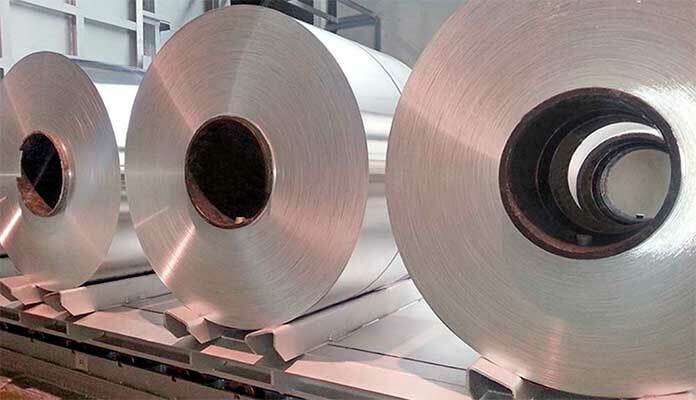 During cold rolling we reduce the hot rolled coils thickness, control the mechanical properties and the thicknesses tolerances requested by the customer. The coils are introduced in the annealing ovens to achieve the mechanical properties requested from our customers of temperatures in the available ovens. After the annealing process the coil is tension levelled. This machine removes the tension from the coils and ensures a better flatness and uniformity of the coils surface.